Related Companies and at least one of their subcontractors, Brooklyn Ready Mix, have apparently experienced difficulties acquiring, reporting and maintaining Workers’ Compensation Insurance. A basic and essential protection for workers, Workers’ Compensation Insurance protects workers injured while working by ensuring access to medical treatment and compensation for lost work time. The Miami Dolphins, also owned by Steven Ross, has a history of attempting to curtail workers’ compensation filings. The Miami Dolphins filed a lawsuit against over 80 former players when they attempted to file workers’ compensation claims in California. At Related’s 50 Hudson Yards, a stop-work order for failing to secure Workers’ Compensation coverage was issued against Prime Mix Corp on August 23, 2018. The subsequent investigation described Prime Mix Corp as doing business as Brooklyn Ready Mix, a concrete producer at 50 Hudson Yards. During the investigation, a Prime Mix Corp representative claimed that the company did have an active workers’ compensation insurance policy, despite the fact that it was not available on the investigators’ coverage database. Days later, an active policy was found for Prime Mix Corp, but with an effective date of 8/13/2018, which lists “SOUTHEAST EMPLOYEE LEASING SERVICES INC” as the insured entity associated with Prime Mix. The new policy demonstrated active coverage on the date of the stop work order, but still evidenced a gap in coverage of 51 days since the cancellation of Prime Mix Corp’s prior policy on June 22, 2018 for ‘Non-Payment’, according to the New York State Insurance Fund. 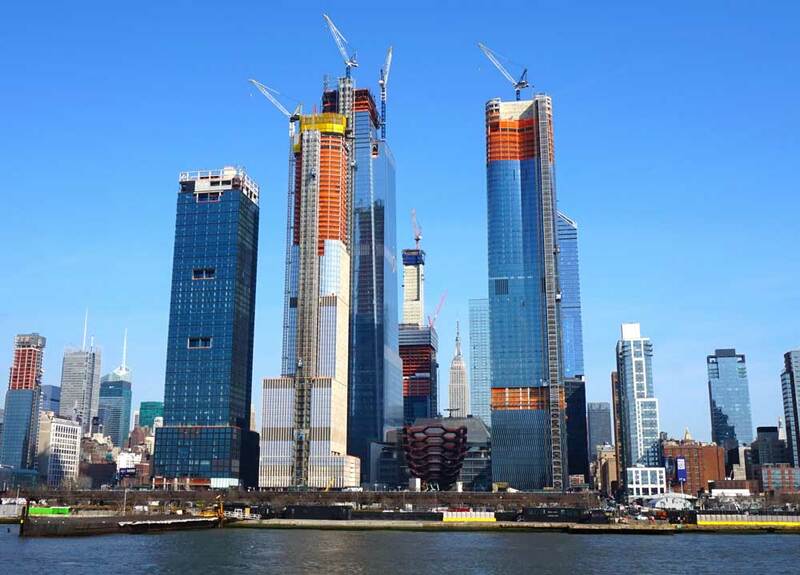 Despite the stop-work order, Brooklyn Ready Mix continued to work and pour concrete at 50 Hudson Yards. Investigators note in their report that after the stop-work order, they observed the Brooklyn Ready Mix driver continuing to rinse his vehicle and equipment. The driver claimed that he was cleaning to prevent dry cement, because he was previously deducted 2.5 hours for damaging the cement mix and was warned he would be deducted more if it happened again. Additionally, photographic evidence taken from at least 10:58 AM to 1:46 PM documents continued work by Brooklyn Ready Mix in 4 separate vehicles along with associated activity through the trucks’ facilitation of concrete pours. The photographs appear to show the investigators walking the jobsite at approximately 10:51 AM and work continuing by Brooklyn Ready Mix employees after the investigators left the job. Additionally, the NY Compensation Insurance Rating Board does not list Brooklyn Ready Mix as part of Prime Mix’s Combinable ID, a unique identifier that indicates a shared majority control between entities. Assuming the entities are indeed under separate ownership, then Brooklyn Ready Mix is either improperly working under the workers’ comp policy of Prime Mix Corp or has no policy. Furthermore, a lawsuit brought by Tilcon New York Inc. against the company alleges that Prime Mix Corp operates as an alter-ego of Sky Materials Corp. In the lawsuit, the plaintiff claims that Prime Mix is a “corporate fiction” operating as a means “to perpetrate fraudulent conduct, a means to evade existing financial and legal obligations, and protect to justify a wrong.” The complaint cites two bounced checks issued to Tilcon by Sky Materials Corp as “replacements” for bounced Prime Mix checks in support of the allegation. Sky Materials Corp has pled guilty to offering a false instrument for filing in connection with a workers’ compensation insurance fraud case brought against the company. The CEO of Sky Materials Corp was also indicted on multiple felony charges for insurance fraud and for offering a false instrument for filing, but his case is ongoing. The NY State Workers’ Compensation Board penalized Sky Materials Corp for $140,000 due to its failure to maintain or produce records from January 1, 2013 to November 9, 2016. The possible connection of Sky Materials Corp to Prime Mix/Brooklyn Ready Mix raises concerns about further possible insurance fraud. Three entities of Related Companies—Related Management Co., Related Fund Management, and Related Partners—were debarred by the New York State Department of Labor on May 19, 2018 for their violations of workers’ compensation law. This status prohibited the entities from submitting bids or receiving awards for any public work until the violations were resolved. Related Management Co. LP, Related Fund Management LLC, and Related Partners Inc. faced penalties of $22,000, $5,000, and $22,000, respectively. On June 29, 2018 the NYS DOL removed the three entities from the debarment list and rescinded the penalties it had issued for the period of March 1, 2018 to June 18, 2018. A prominent safety advocate remarked that it was a “huge red flag for safety advocates” for a multi-billion dollar company like Related to show up on the debarment list. Ross’ connection to companies with a track record of disrespecting workers’ rights when injured on the job extends beyond the construction industry in New York City. As the majority owner of the Miami Dolphins, Ross has brought his disregard for workers to Florida. Under state law in Florida, NFL players are not classified as employees and are not protected by workers’ compensation laws. Dolphins players also have strict timeframes for claiming injury: under their contract, players are ‘responsible to report reasonably ascertainable injuries to the Dolphins’ trainers or doctors orally or in writing within 30 days of an incident. If the injury is not apparent at the time sustained, pursuant to Florida law a player has two years from the incident—or one year from a treatment paid for by the Dolphins—to file a workers’ compensation claim. Brain injuries caused by repeated head trauma—common in football players—may not present themselves within the limited two years Dolphins players have under Florida law. Never miss an update - Sign-up now!